Can a couple with divergent tastes make their home remodel work? 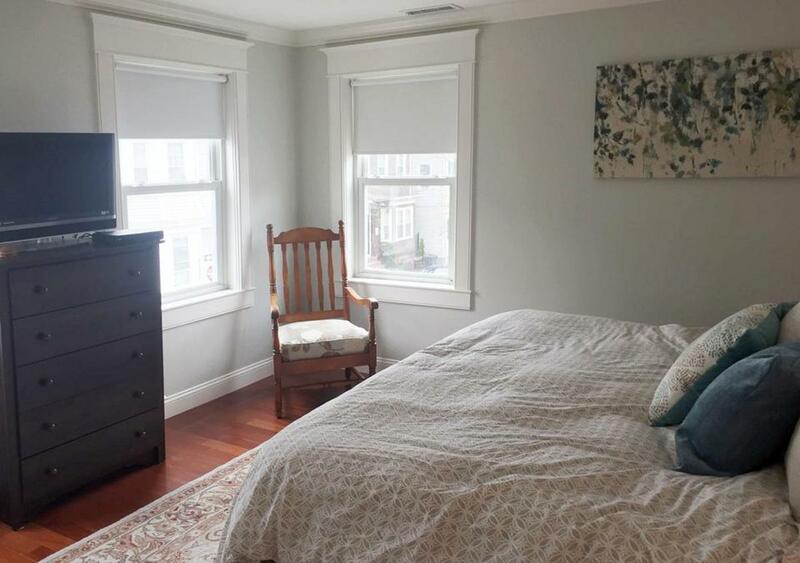 Vintage meets contemporary style in this charming 1890 Southie renovation. Homeowner and designer Trevor Fulmer used a small backsplash, rather than continuing the stone up the wall, to maintain a better connection between the kitchen and the dining area. The couple moved to Southie from the South End in the summer of 2016 after triumphing over 15 other would-be buyers to land their house. “We fell in love with it because of the historic charm,” Fulmer says of the 1890 residence. 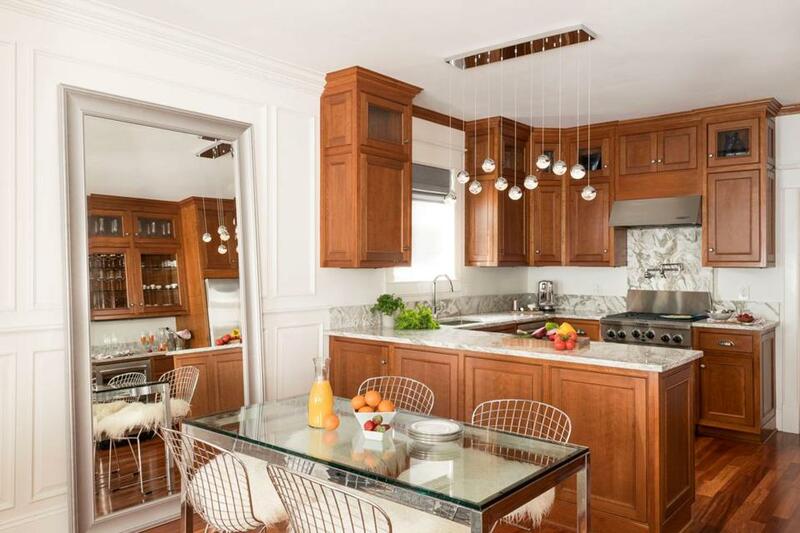 “We thought many Boston condos felt cookie-cutter and lacked character.” The 1,676-square-foot single-family property has three bedrooms, a two-car garage, and outdoor living space near the water. The place was in good shape overall, though the kitchen needed work. With some easy changes, Fulmer transformed the home into a showplace fit for a style-savvy couple. The first major fix was to lop off the double-height counter that topped the peninsula separating the kitchen from the dining area. “It jutted into the dining space, visually dividing the rooms, and didn’t leave space for a dining table,” Fulmer says. With the counters now all one height, he installed gray-veined white dolomite tops in place of the original black granite. In a nod to Mattus’s love for gadgetry, the new sink has a touchless faucet activated by a motion detector. The dramatic light fixture above the peninsula is a contemporary touch that contrasts with the Craftsman-style cabinetry. The height of each orb is adjustable, allowing Fulmer to set them just so. “It’s an art piece that glows,” he says. 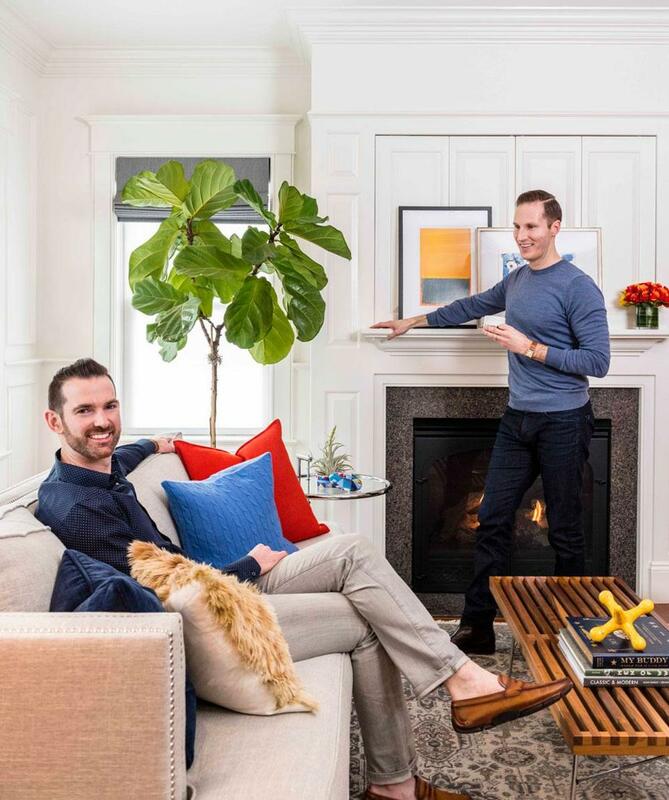 Jim Mattus (left) and Trevor Fulmer relax in their South Boston living room. 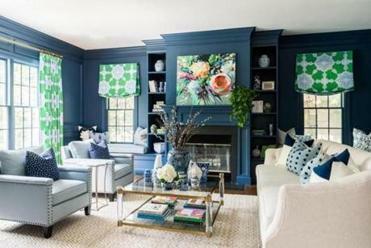 A designer employed shades of blue and quaint architectural upgrades to give this 1990s five-bedroom Needham home a family-friendly makeover. An oversize mirror from HomeGoods with the proportions of a doorway leans against the far wall, the reflection framing the stairway (which retains the original 1890 treads). The reflective surface not only opens up the space but gives the illusion of a whole other room. Fulmer added picture molding to the upper portion of the walls to echo the existing wainscoting below, an elegant detail that enhances the home’s classic feel. Benjamin Moore White Dove paint unifies the space and renders it both bright and warm, as do the refinished wood floors. The living room décor blends both men’s tastes. The sofa’s clean lines appeal to Fulmer, and its transitional styling — the piece sports nailhead trim, which Fulmer says his husband would add to anything — works for Mattus. The mid-century modern flavor of the caramel leather Seville chair, modeled after Mies van der Rohe’s iconic Barcelona chair, suits Fulmer’s taste without feeling cold or off-putting. The finishing touches are also studies in compromise. A vintage Persian rug incorporates age and character, while the three-dimensional artwork by local fiber artist Dora Hsiung is a colorful, contemporary showstopper. “It changes color when you walk from one side of the room to the other,” Fulmer says. 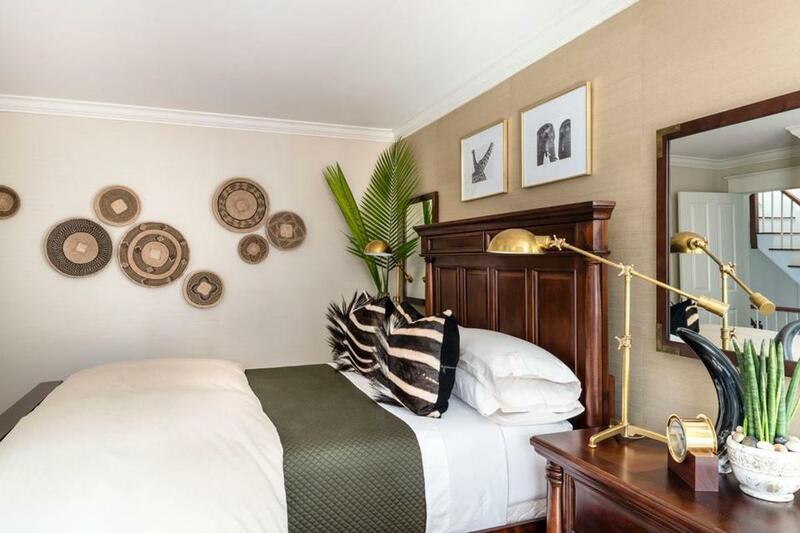 Fulmer arranged hand-woven Binga baskets from Etsy on the wall in the safari-themed guest bedroom, where the couple reused furniture Mattus owned before they met. He did, however, bow to his partner’s distaste for a pair of white acrylic bedside tables, replacing them with wood chests. And he trimmed the upholstered headboard with nailheads. The trophy-style table lamps remind them of a vintage trophy display they once admired in the Ralph Lauren store on Newbury Street. The safari-themed guest room also plucks inspiration from the famed designer. “When I said I want to do a themed room, Jim was skeptical,” Fulmer says. He swayed Mattus by pointing to Lauren’s fondness for safari-themed rooms and fashions, as well as Fulmer’s own mood board, which incorporated photos of five-star hotels in the Serengeti. 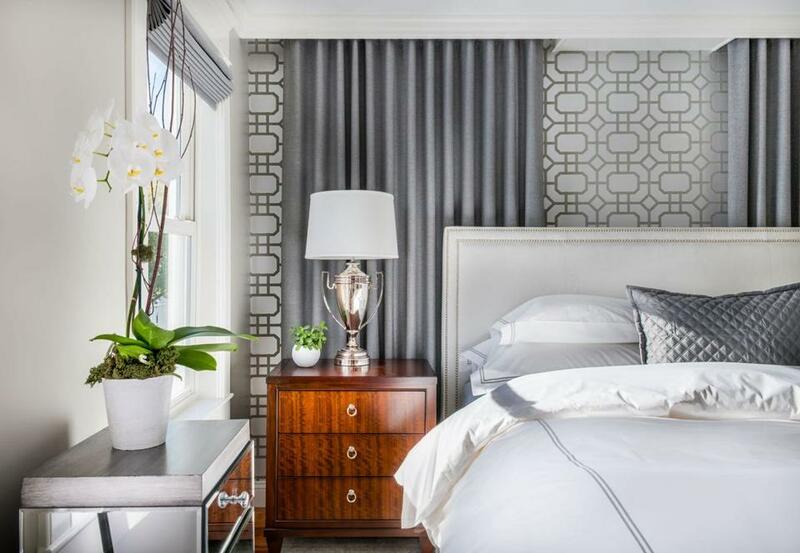 The room abounds with textures, including grass-cloth and faux-alligator wallcoverings, hand-woven baskets from Zimbabwe, fresh greenery, and throw pillows made from zebra skins. “Friends and family are always excited to stay in the safari room,” Fulmer says. 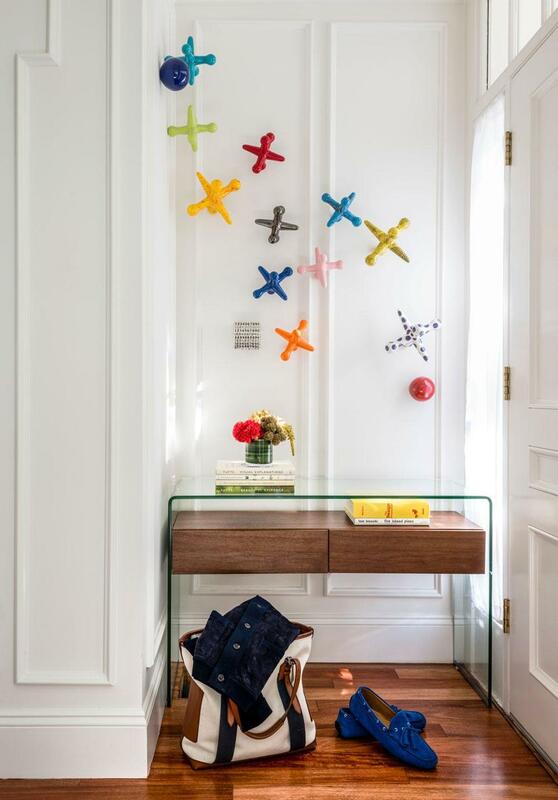 Beneath the ceramic jacks in the entry, a glass waterfall console with a wood inset lends the appearance of a floating shelf. BEFORE: The master bedroom, pre-renovation. AFTER: Fulmer hung drapery panels behind the bed on two sides, even though only one covers a window. The geometric wallpaper is Portier Flock by Thibaut.